The boys made a handfull of films after parting company with Hal Roach. Which one do you think is the best? Select the button next to the film of your choice, then select the "cast your vote" button at the bottom. Remember, every vote counts but please only vote once. This survey started in September 1999. 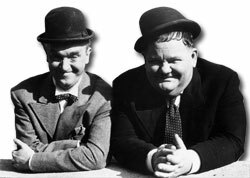 Which is your choice as the BEST Laurel & Hardy feature produced by a studio other than the Hal Roach Studios?